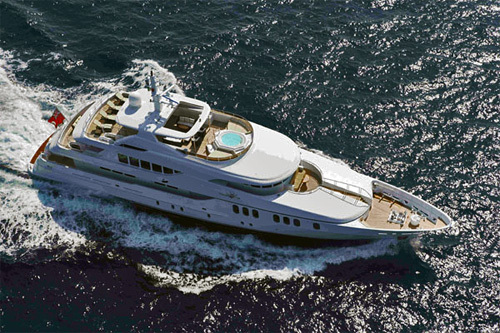 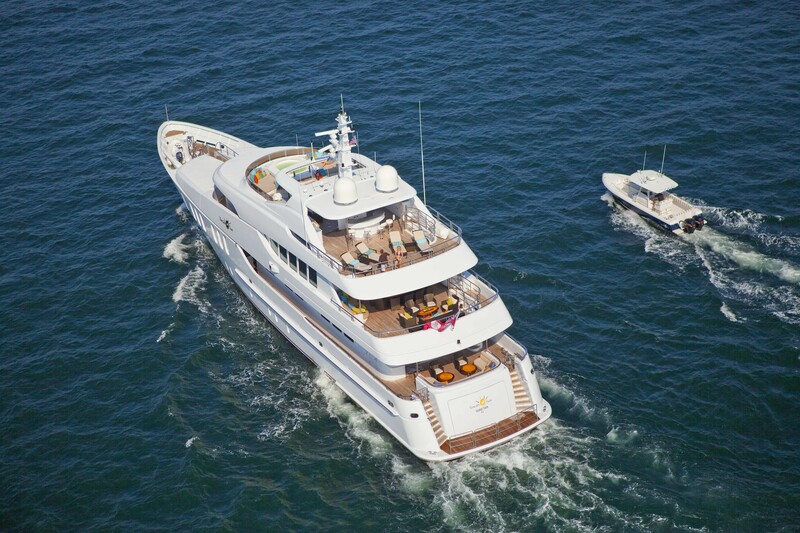 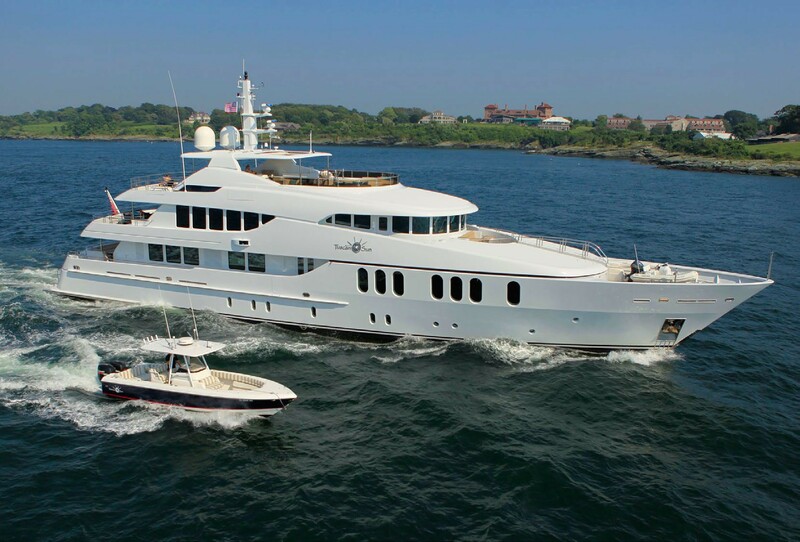 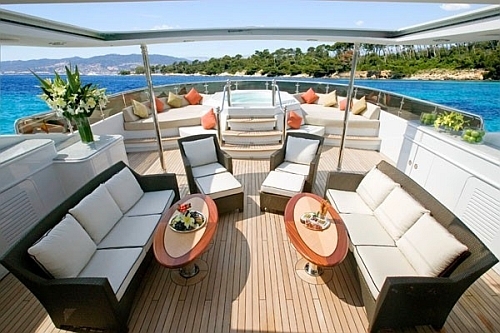 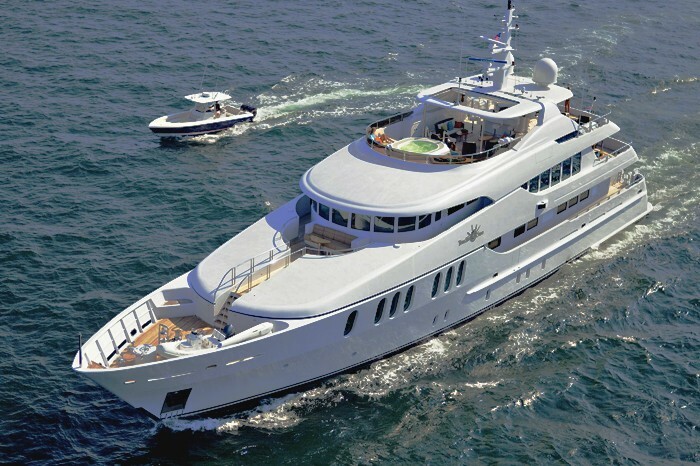 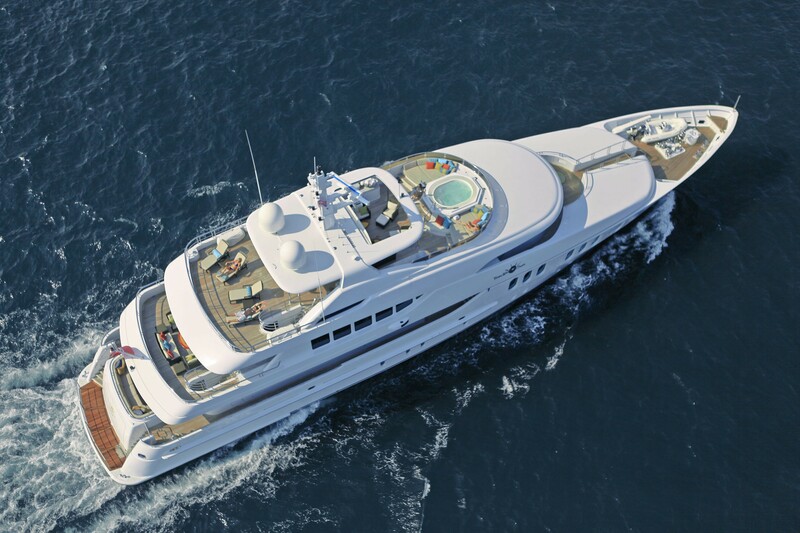 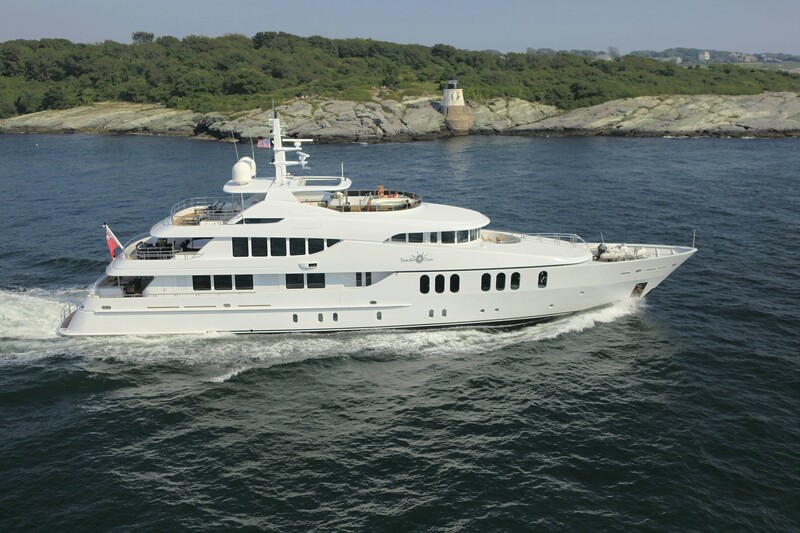 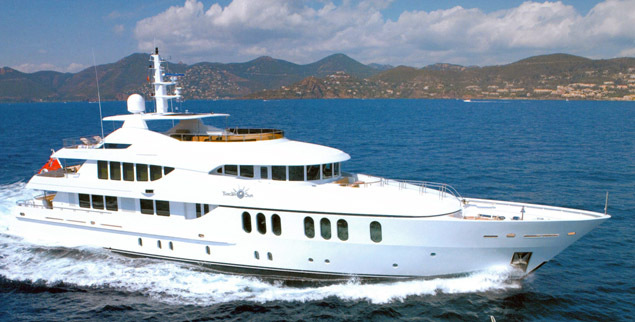 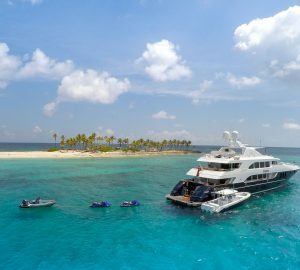 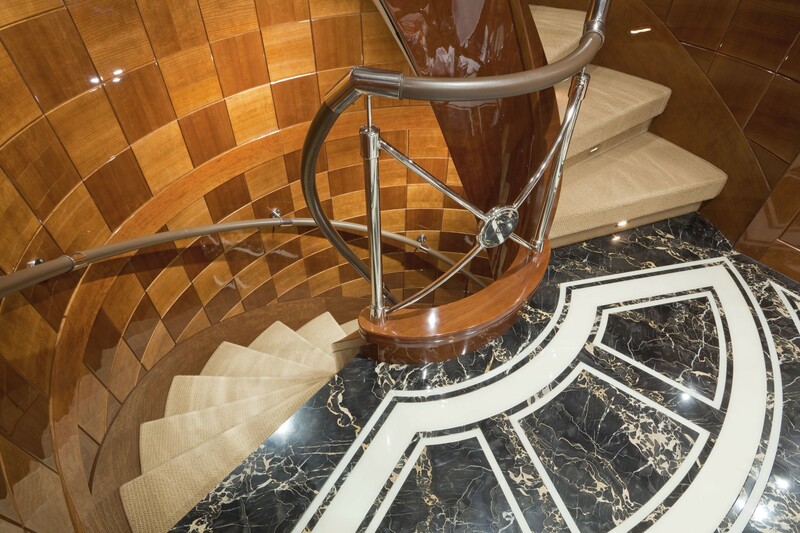 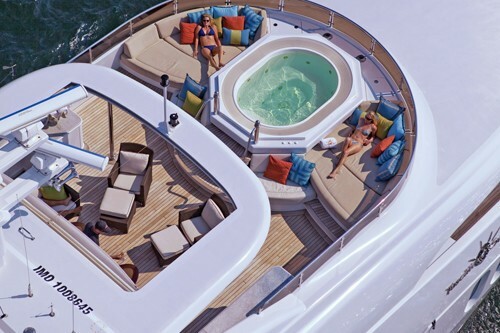 COCO VIENTE is a luxury motor yacht which cruises in the Mediterranean. 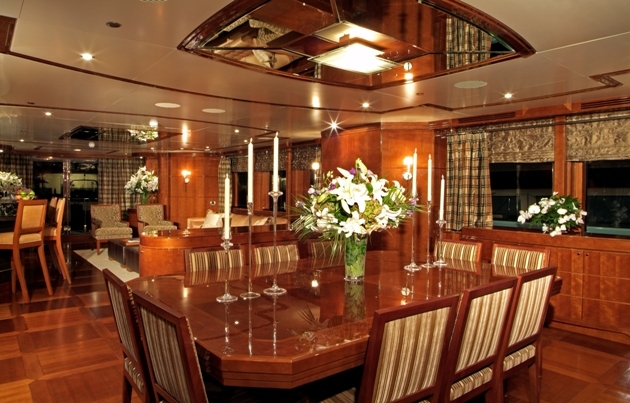 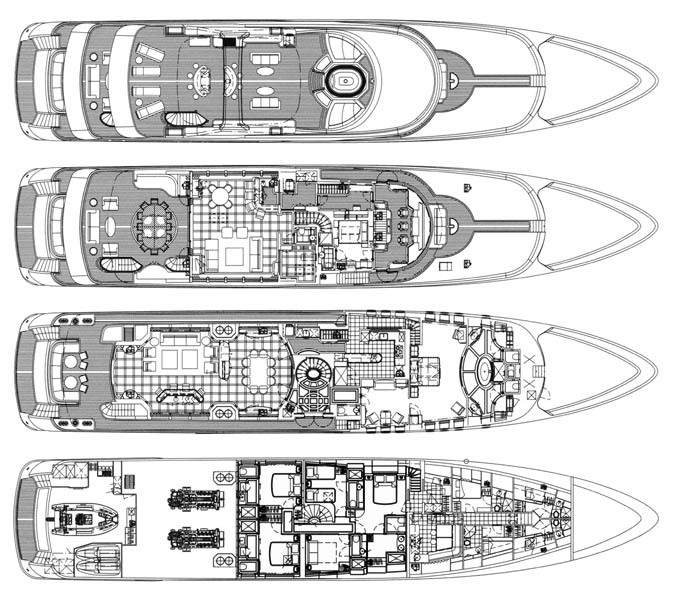 She is a beautifully built yacht by Izar/Navantia, and can comfortably accommodate 12 guests in 6 cabins. 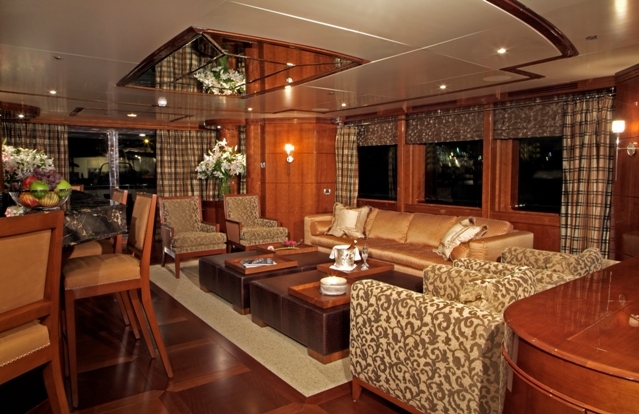 The main salon of COCO VIENTE (ex Tuscan Sun) has a full entertainment centre with comfortable and spacious lounges. 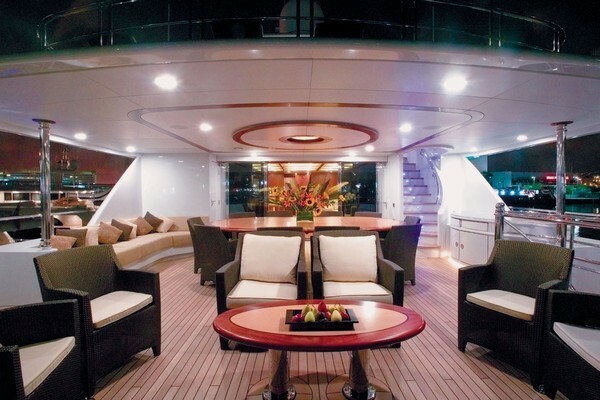 There is a 50 inch wide screen pop up 360 degree rotating plasma TV/DVD/CD. 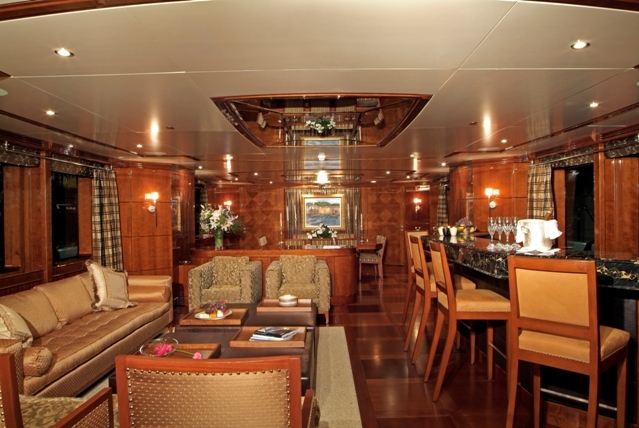 There is also a full bar with seating for 4 people and formal dining for 10 people adjacent to the main salon. 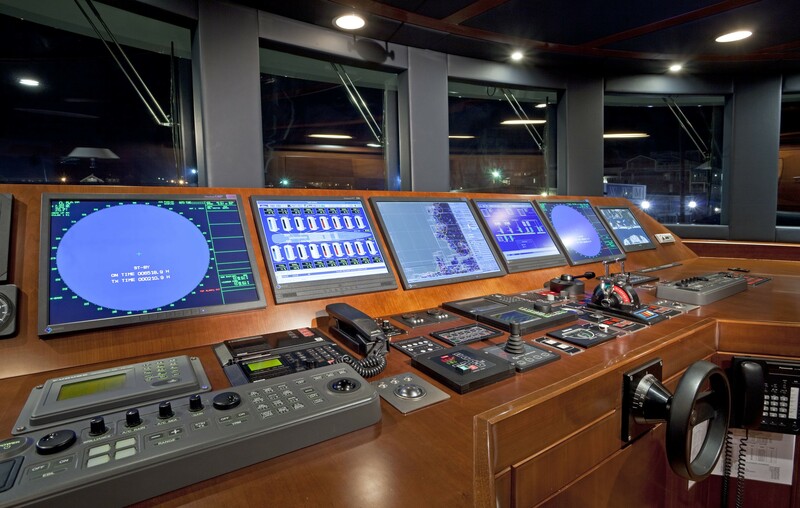 Forward starboard there is a day head. 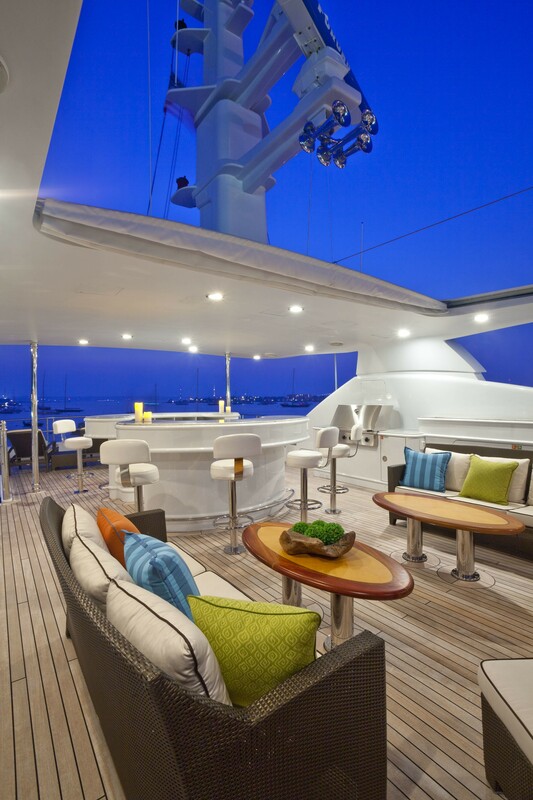 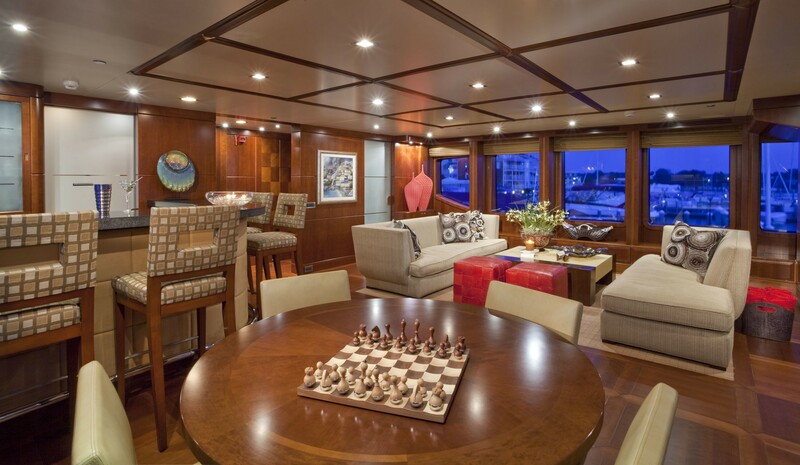 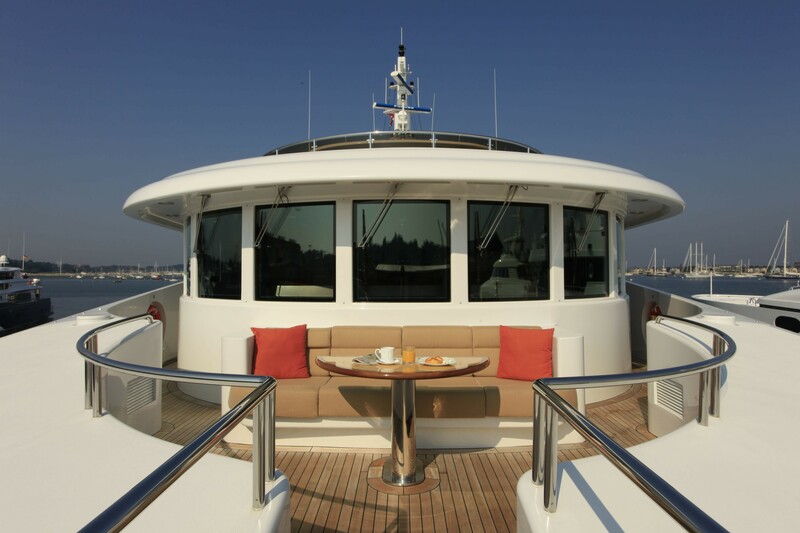 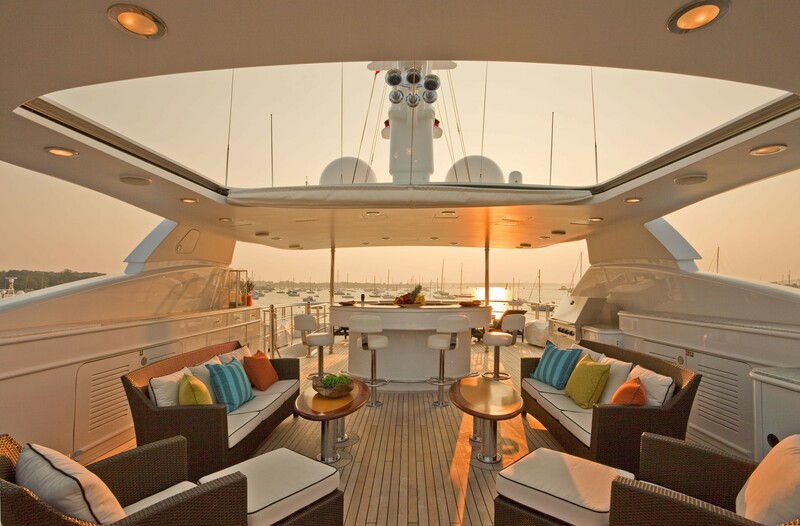 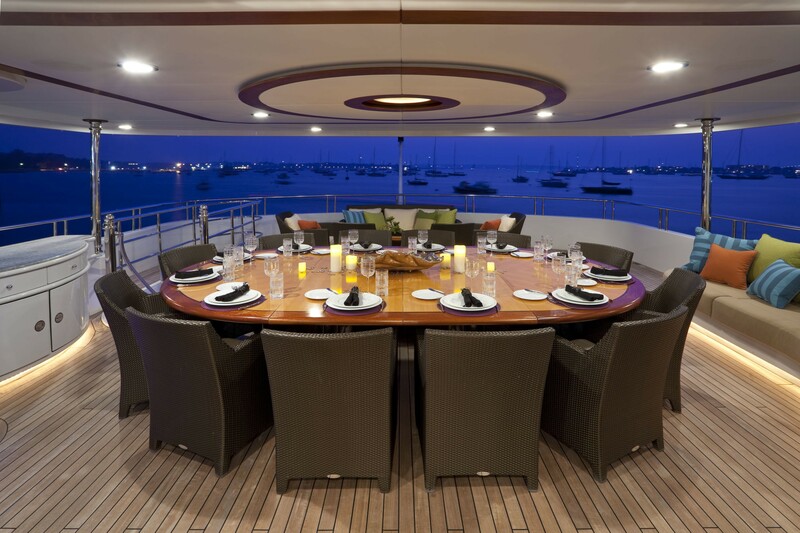 On the aft deck of COCO VIENTE there is a large open shaded seating area. 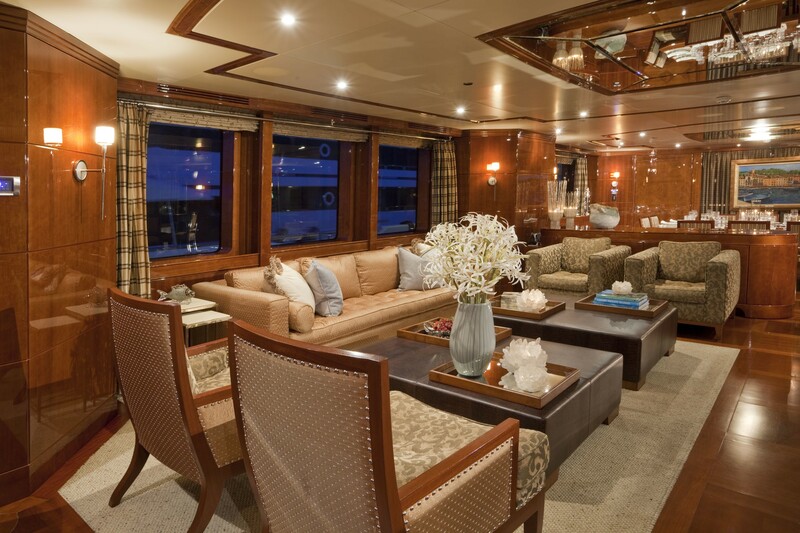 In the sky Lounge there is another entertainment centre with another 50 inch plasma TV, with a spacious lounge area, full bar, and a game table. 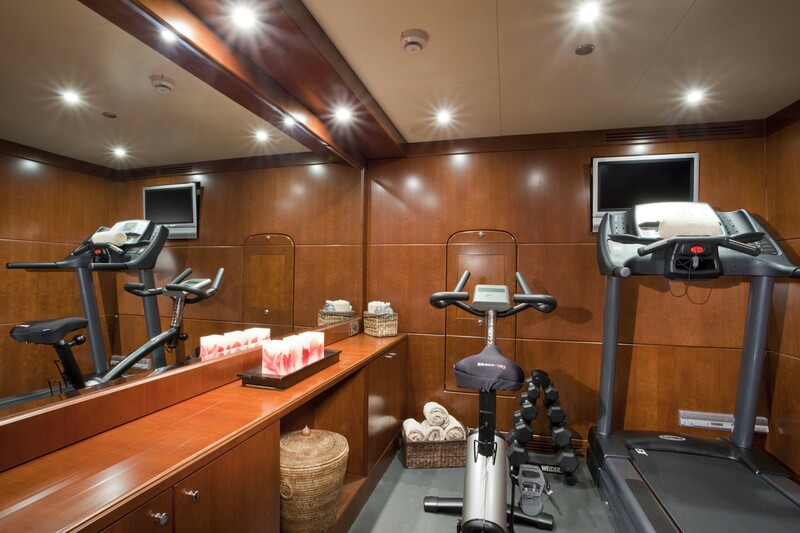 Next to the sky lounge there is a gymnasium with free weights and yoga mats. 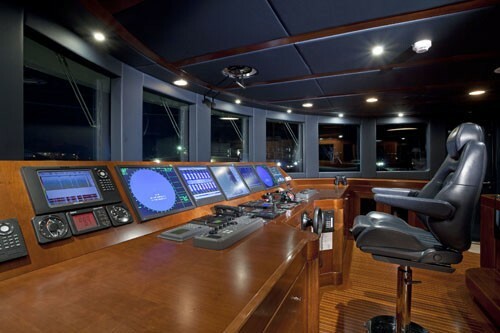 Also has an adjacent day head. 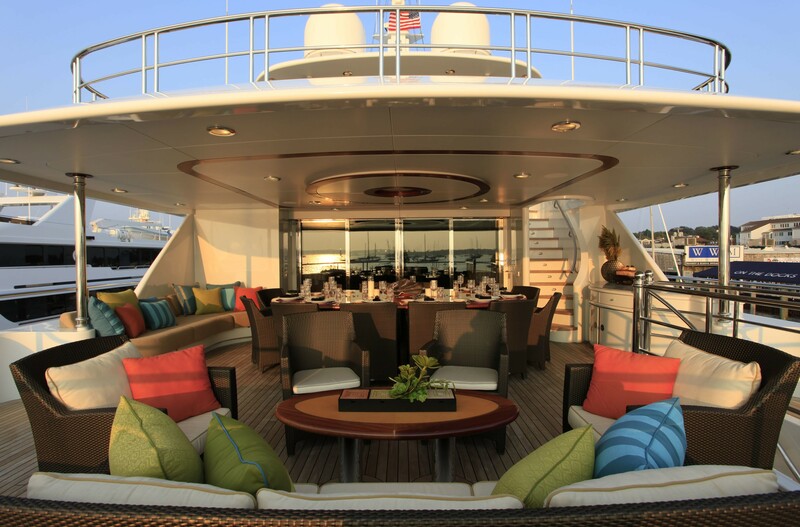 The sky lounge deck has a large shaded seating area also with alfresco dining for 8 but can expand to accommodate 10-12 people. 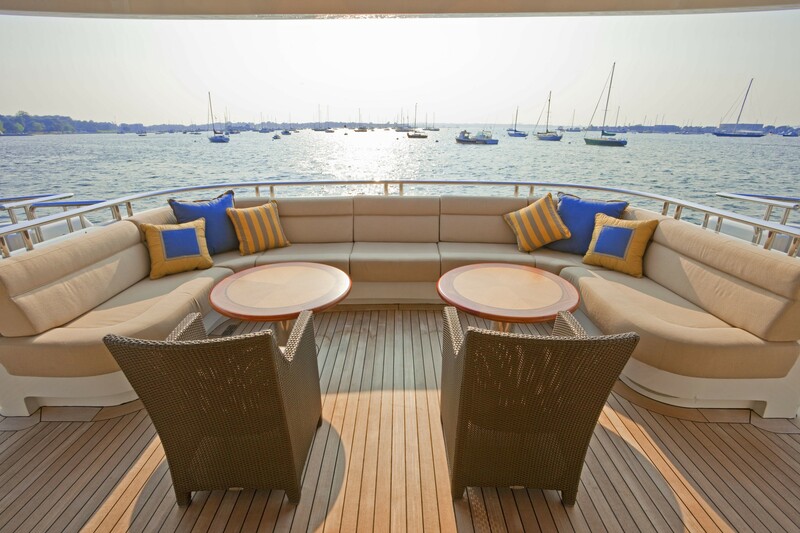 The fly bridge is open with a retractable sun roof and ample seating with 2 couches and 2 large chairs, and 4 lounge chairs aft. 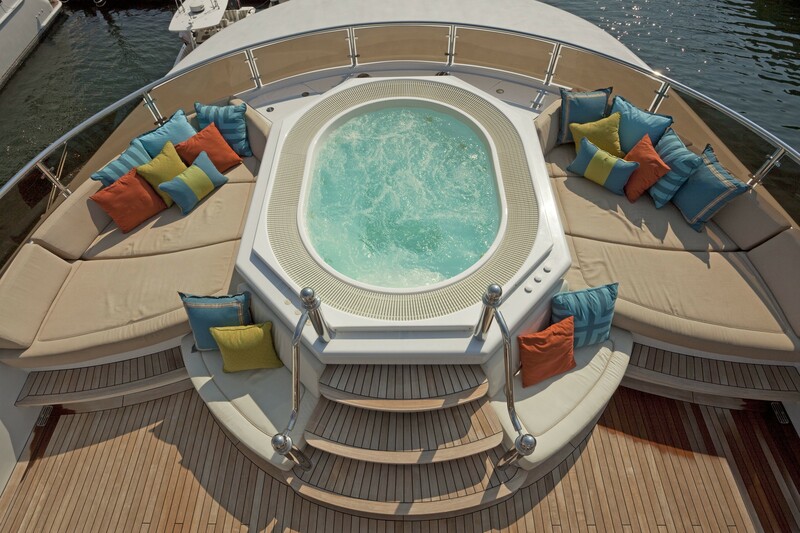 There is a full bar with stool seating for 8 people and there is a Spa Pool with adjacent sun pads. 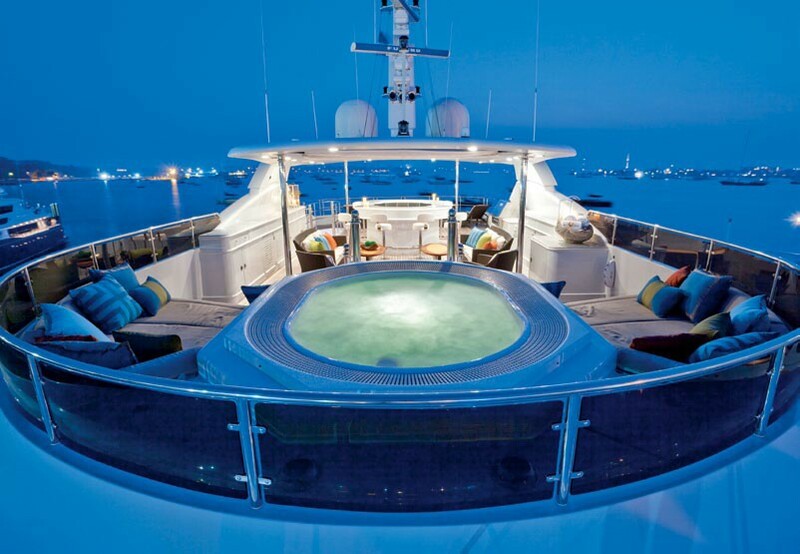 There is also an electric grill here. 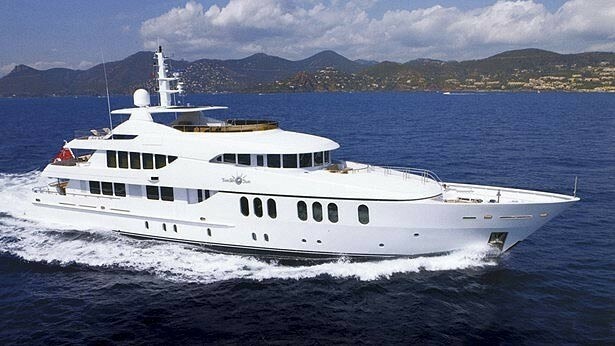 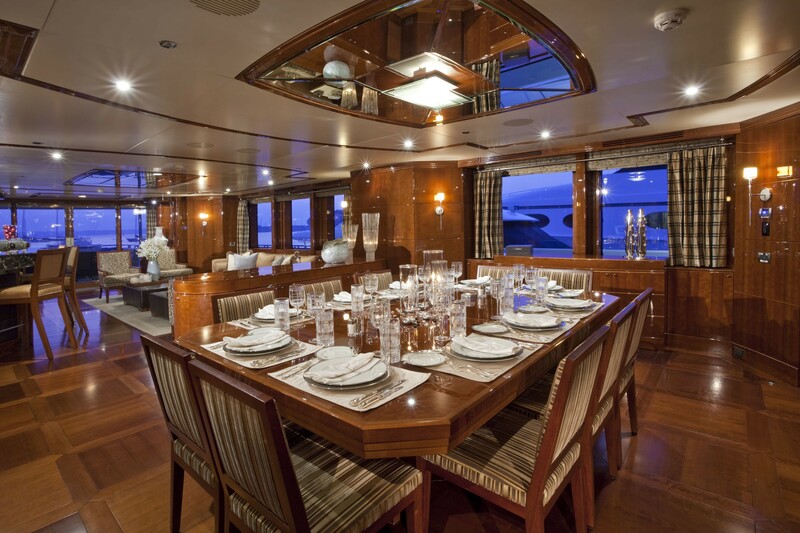 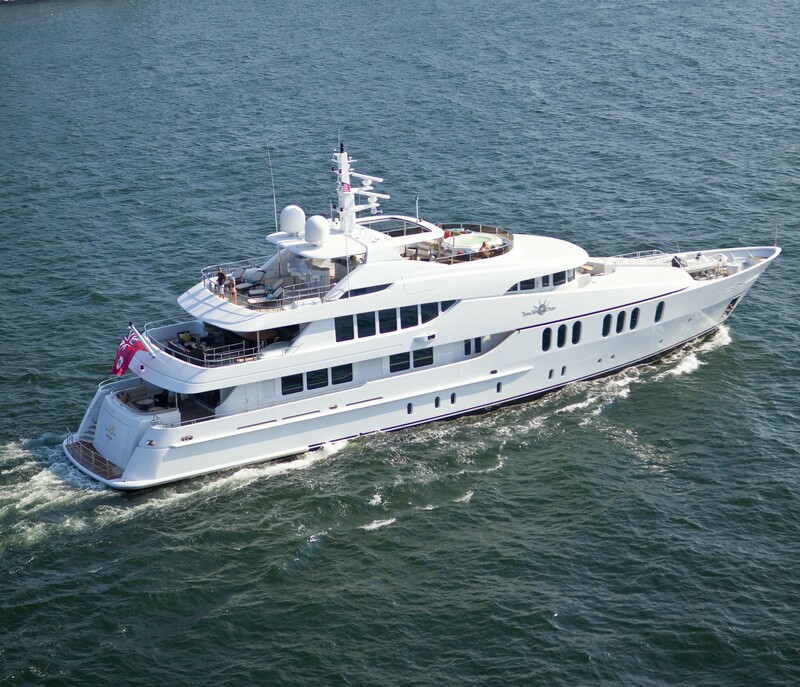 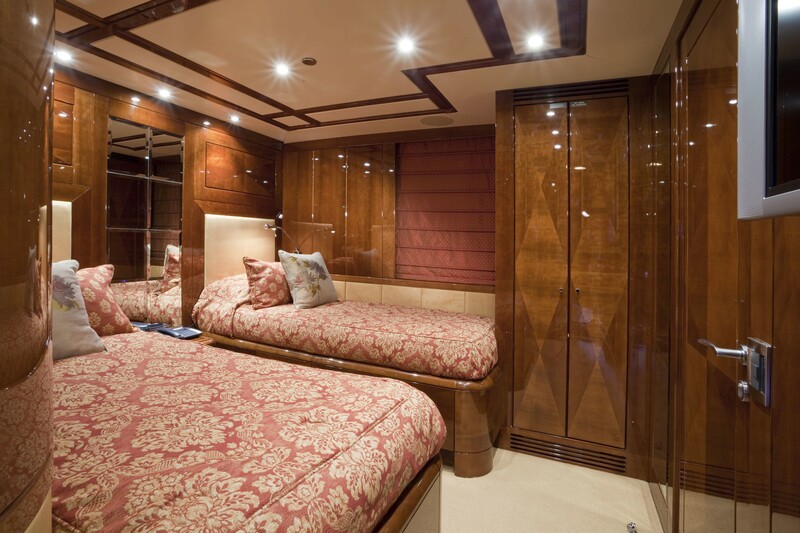 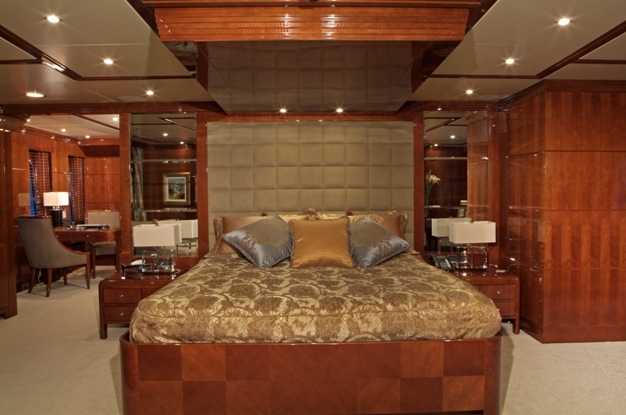 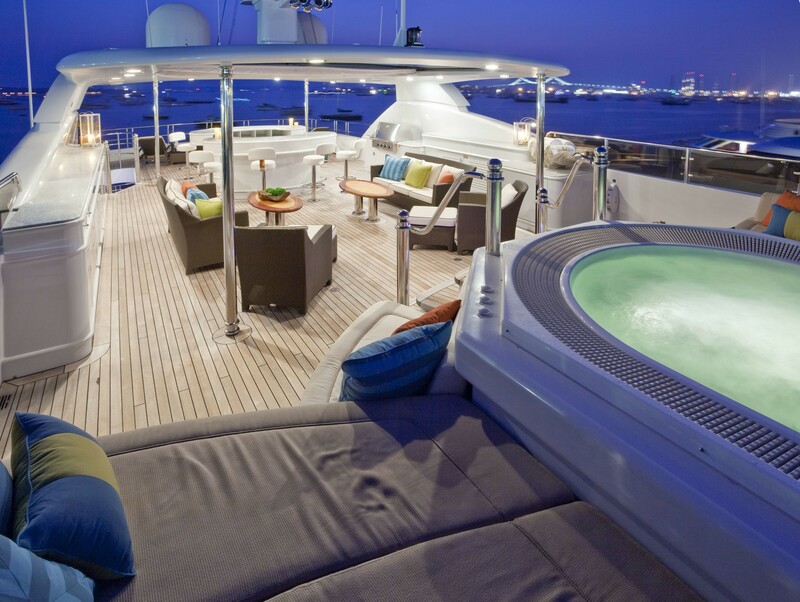 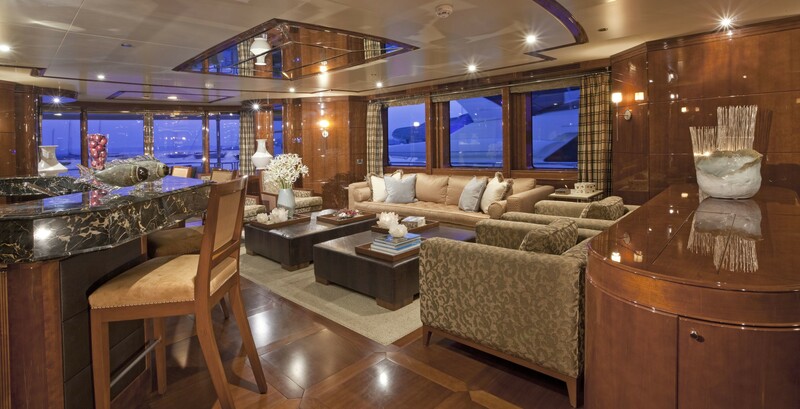 Luxury yacht COCO VIENTE can sleep 12 guests in 6 cabins. 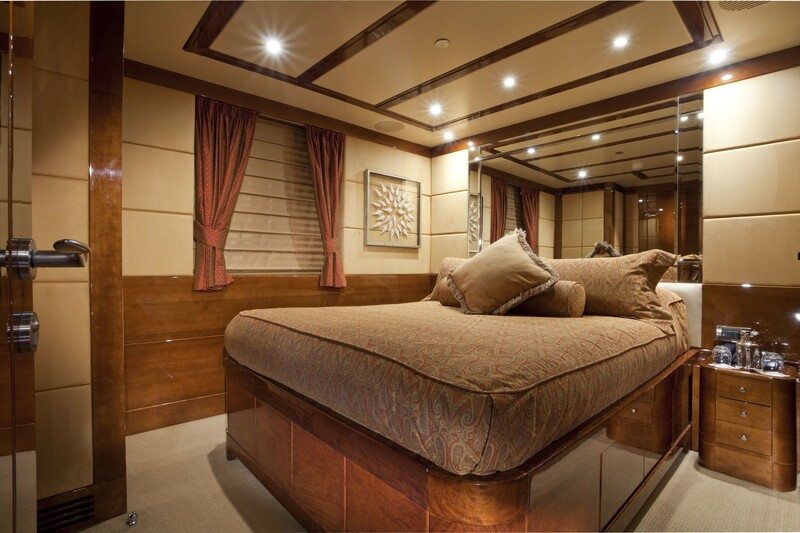 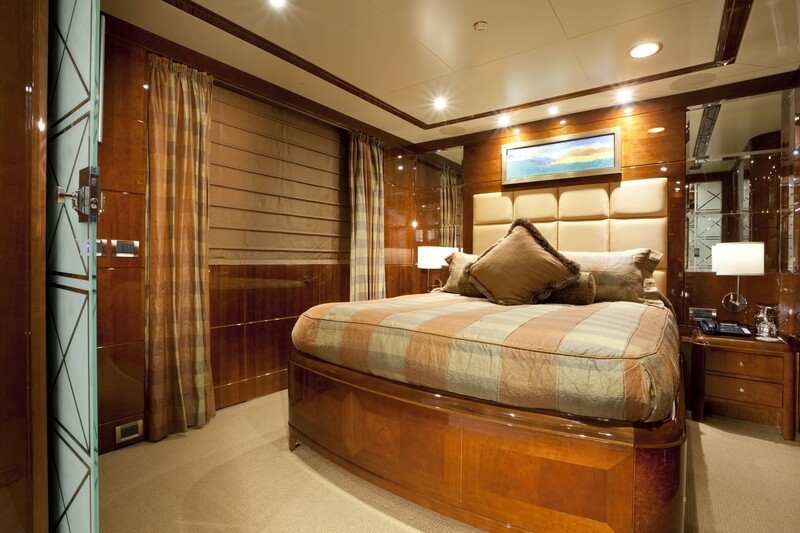 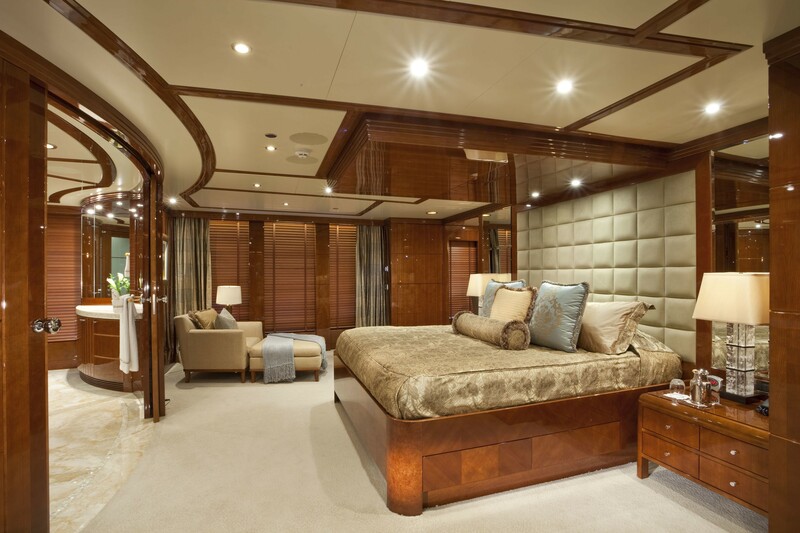 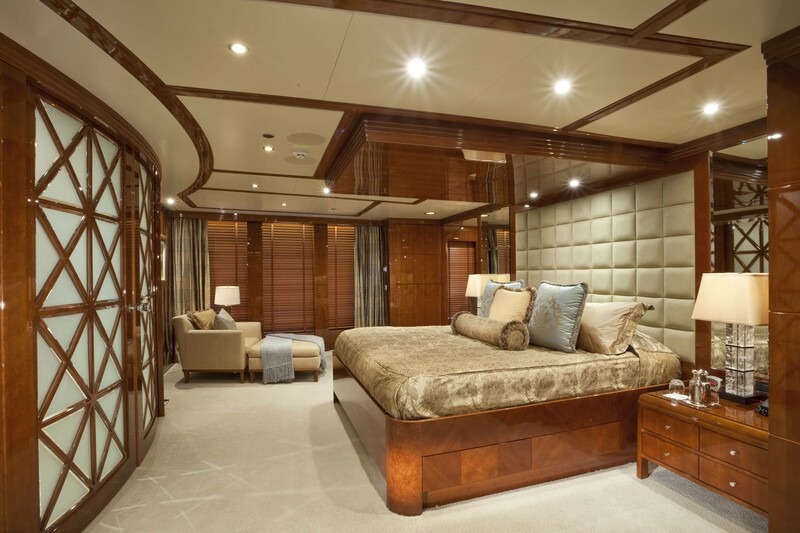 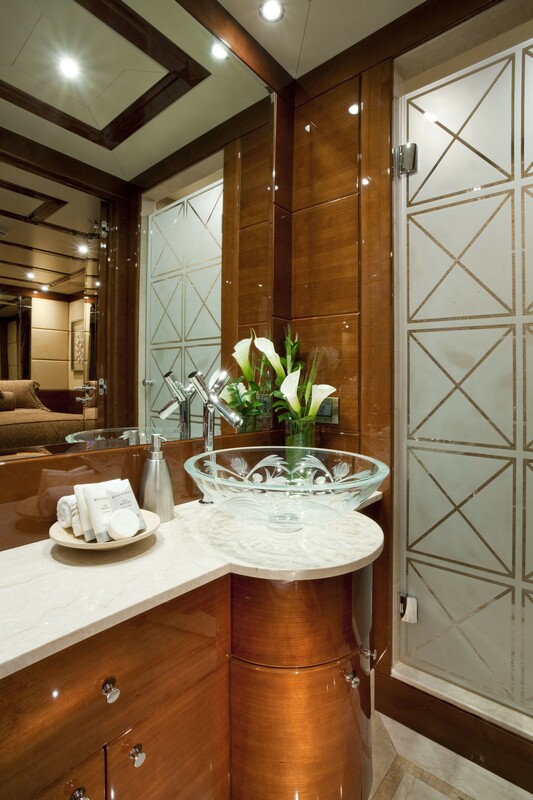 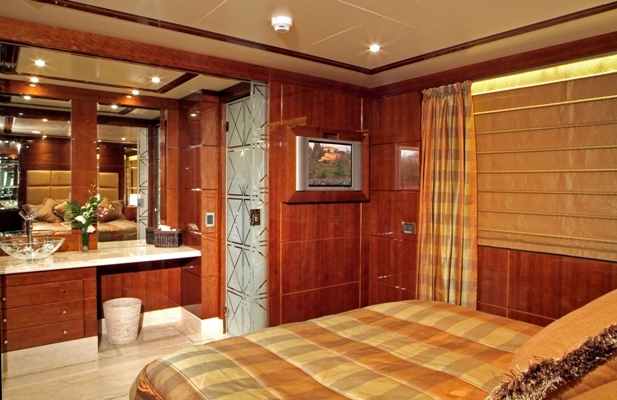 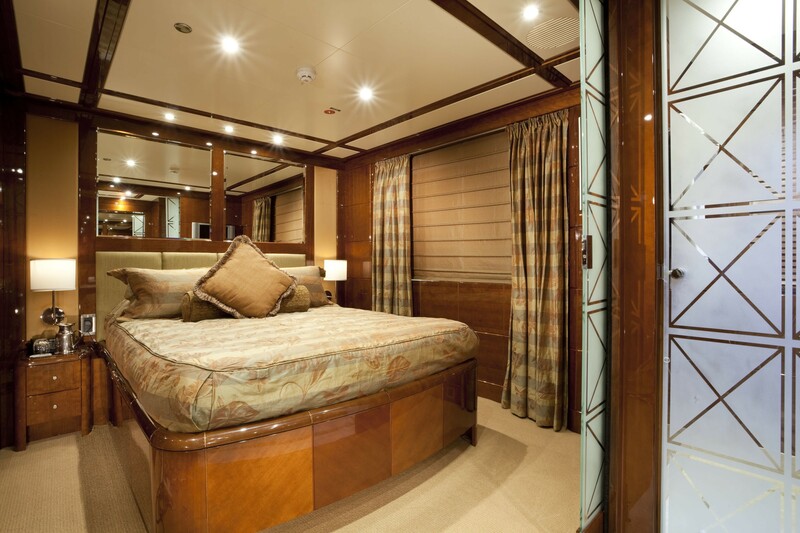 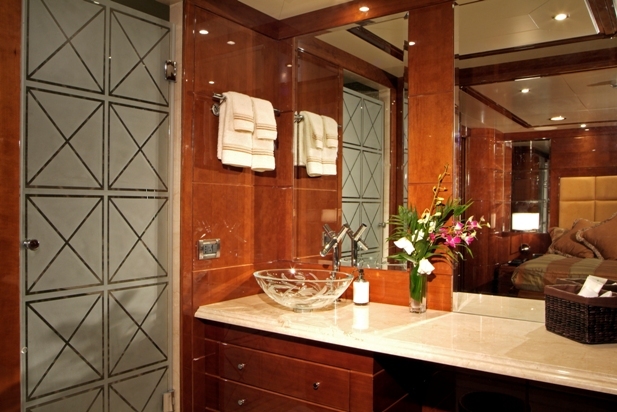 The master stateroom is forward on deck and full beam with a King bed and ensuite with His/Her bath and Spa Pool Tub & a large shower compartment. 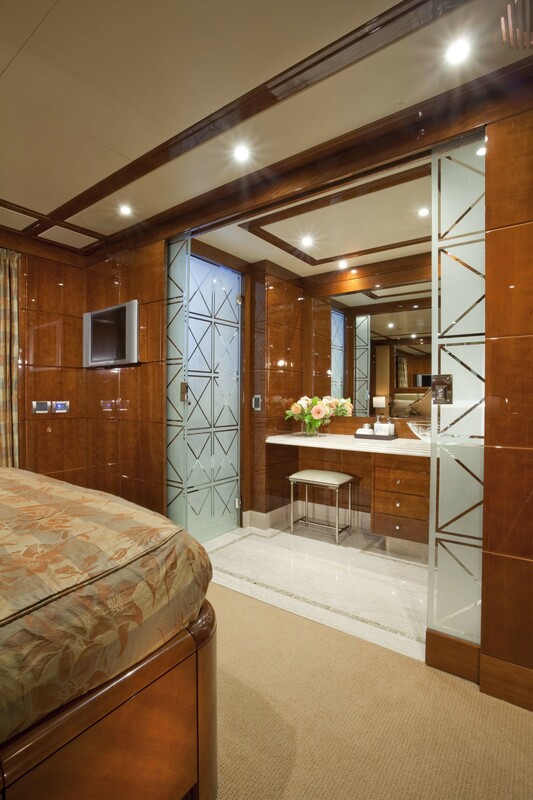 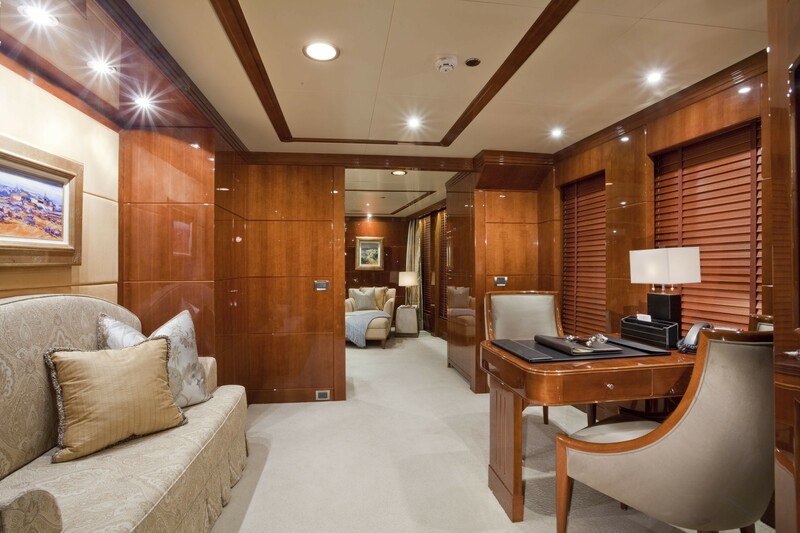 The master stateroom cabin also has an adjoining office. 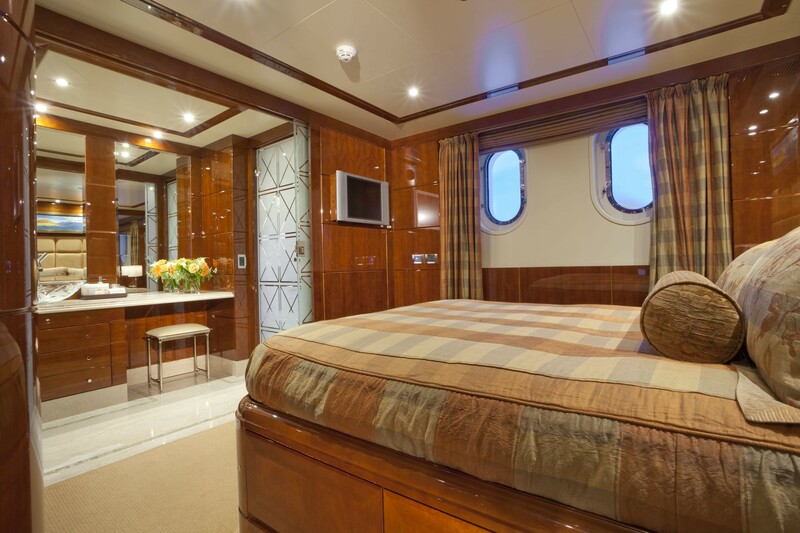 Her VIP Stateroom is full width and situated on the lower deck to forward and has a King bed, and ensuite bath with tub & shower. 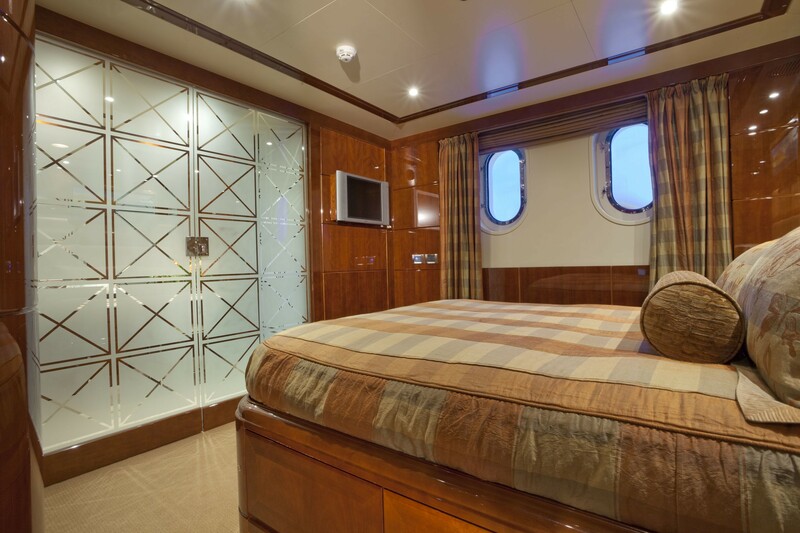 There are a further four guest staterooms, 3 of which have double beds and one with twin beds. 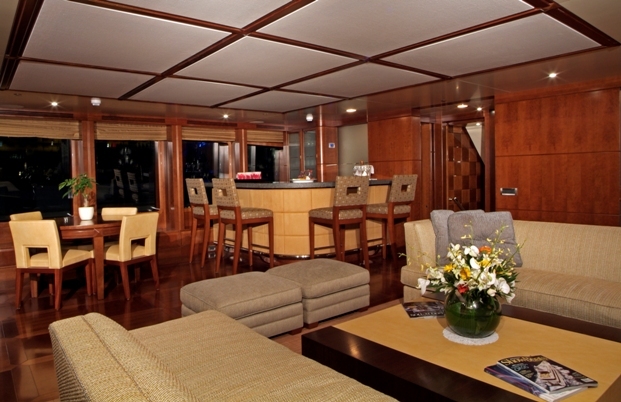 COCO VIENTE has a 32 ft Intrepid tender and a 16 ft Novurania Equator 500 tender. 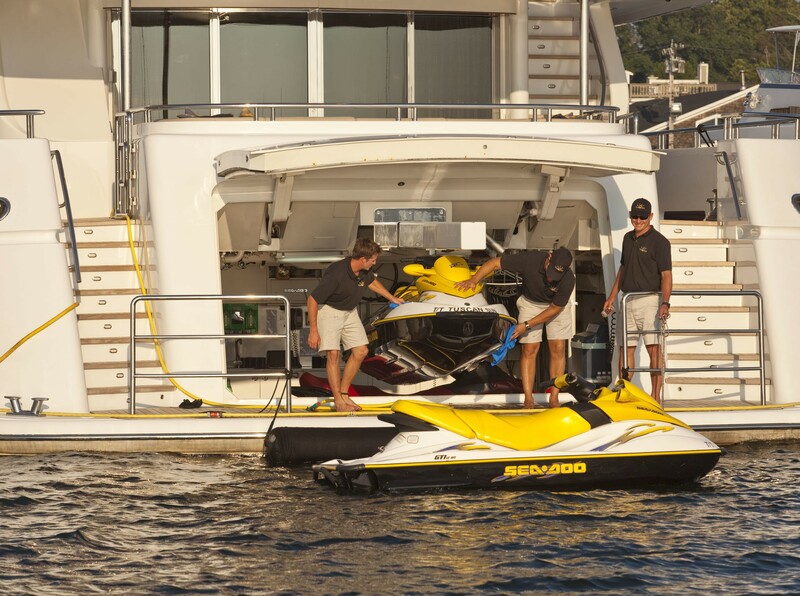 For water toys, TUSCAN SUN also has two 3 person Sea-Doo watercraft jetskis, kneeboards and wakeboards, 2 person kayak, six floating loungers and assorted snorkel gear si tubes and water ski equipment.